Growing up, one of my favorite Fall activities was shopping for school supplies. I loved picking out fistfulls of colorful pens and pencils, Lisa Frank folders, and a new binder for the year. I always made sure to pick a binder with a clear folder in front so that I could make a collage out of magazine clippings. It was very important to me to properly personalize it and create my pièce de résistance. If you were to come visit my office in New York City, you’d see that old habits die hard. You’d notice three or four corkboards on the walls opposite my desk. I always have a board up for my business Luxury Monograms, and for my personal brand. But the other boards rotate based upon what projects I am currently working on. TIP: I never take apart my boards. I simply order another one on Amazon, and store older versions in my closet. 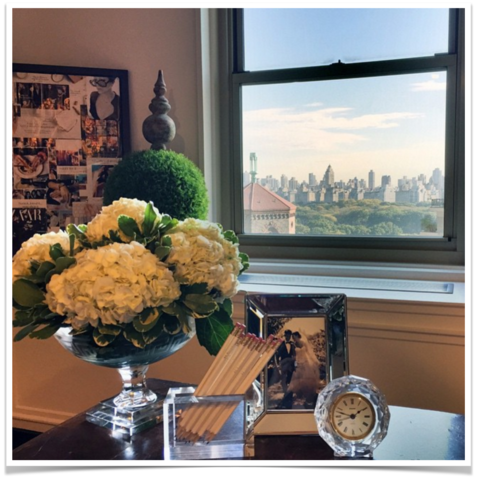 They’re more than conversation pieces or unusual objets d’art; these are my vision boards for different aspects of my life and business, and they are never far from my mind or my line of sight when I’m working. 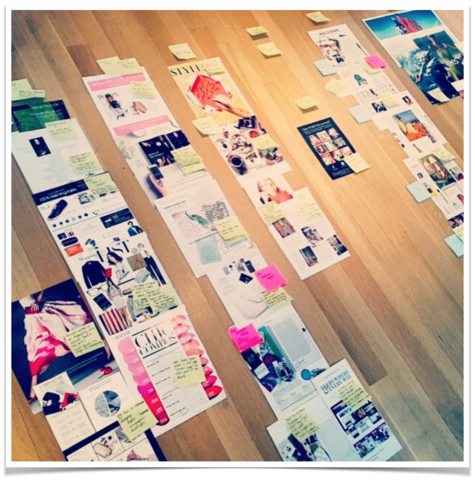 At its simplest, a vision board is a collection of images, objects, words and ideas. A vision boards should contain what excites and inspires you. The power of a vision board happens when you intentionally create it to be a visual representation of everything you want to have, do, and be in your life, and then use that reminder to help you achieve those goals. A vision board should help you visualize what you want your business to look like, the person you need to become to create that success, what kind of freedom you want your business to create for you — in other words, your dream life. You may be familiar with the idea of a brand board or mood board as something that you or your designer create to embody the look and feel of your brand, website, products, etc. A vision board is similar, but is usually for you personally: clothes you want to buy, the car that you want to drive, the places you want to travel, that kind of thing. I recommend that you try infusing the two together. In truth, most of us experience no clear divide between our work life and our non-work life anymore, so why force that separation on your vision board? Vision boards can be incredibly powerful tools to help you manifest the business and life you want. When you surround yourself with images of who you want to be, your business goals, the lifestyle you want, the places that you’d like to travel, the possessions you want to have, and so on, your energy actually changes and you will find that it’s easier to focus on those goals and truly achieve what you want. In addition, this kind of visual and tactile process (cutting out images, gluing them or pinning them) helps your brain start working in a really different way and sparks your creativity. To help you get started, I’ve created a step-by-step Vision Process & Source Checklist that will lead you through the process of creating a powerful vision board to support your dream business. You could have a vision board for every aspect of your life — business goals, brand goals, personal goals, where you want to live, where you want to travel, even who you want to meet. Decide up front whether you want to combine them on the same board, or create different ones. As stated previously, I always have different boards for my different businesses, but mix in many personal elements within them. Do what works best for you. Give yourself some space to think and ask yourself: What do I want to create? This is an incredibly powerful question. Don’t be afraid if you want a million things all at once — or if you can’t come up with a single thing. Just keep quietly asking yourself, What do I want to create? Before long, an answer should start to rise up that’s a little louder or a little stronger than the others. I want to challenge you to dive into the details. What would every facet of your dream life look like? What would you wear, where would you live, what would your office look like/where would you like to work from? If you need a little more guidance for this, I highly recommend Danielle LaPorte’s Desire Map process. Often all I need to do is open up one of my favorite magazines (Porter tops the list) and begin tearing out pages of photos and words that catch my eye. Once you have your answer and you know what you truly want, you can start to physically create your vision board. Poster board with images glued on. These are inexpensive and easy to create. Cork board or bulletin boards with pushpins are my favorite format for vision boards because you can continue to add, subtract and rearrange components. Inspiration walls can be lovely if you have lots of items or large images or objects to display. I know of one designer who uses trays because she includes so many three-dimensional objects. Journals, sketchbooks, and notebooks can be useful too, but part of the power of a vision board is in being able to display and see it often. Pinterest is another great place to collect and store images, but personally I prefer physical images and objects for my visioning. I use Pinterest a lot for gathering images and inspiration. Once you’ve chosen your format, it’s time to start collecting images. 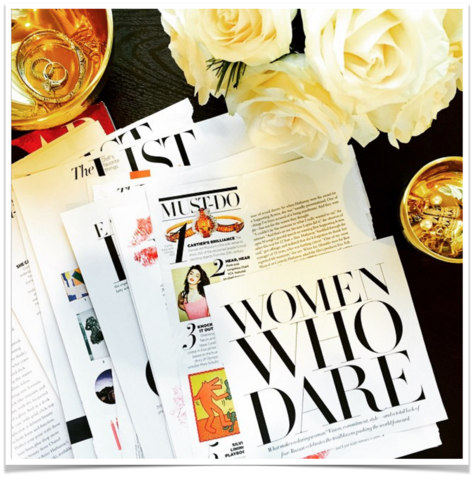 To start, gather a stack of your favorite magazines and start clipping anything and everything that appeals to you. Don’t censor yourself in this part of the process. Let yourself be drawn to what you’re drawn to — and worry about questioning it or discovering the reason later. Tear out pages of typography with words, quotes or phrases that speak to you. Collect logos that you like. Remove pages with photos of your role models. And in addition to tangible items, search for imagery that represents more abstract goals for you such as freedom, creativity, flow, connection and contribution. I also highly encourage you to go beyond pictures. Add things, objects, flowers, jewelry, fabrics, napkins, cards — whatever strikes your fancy. Go beyond two-dimensional! Don’t be afraid to do this even if you don’t have a physical product business. Use physical objects and their tactile sensations to evoke different emotions. I almost always have fabrics and trim on my vision boards because different colors and textures trigger different experiences for me. I’ll include objects that have special significance to me, like a particular pen that I got in Paris, a pair of elegant gold shears from a special photoshoot, or a pearl necklace to remind me of ______. Once you have a large collection of images and words, it’s time to curate them into a cohesive vision. You’ll probably have several images, words, or items that speak to you very clearly, so start with those. Eliminate what no longer seems to fit. I always feel a sense of intuition about what belongs and what doesn’t. It can be a powerful part of the process determining what you’ll keep and what you’ll release. If there doesn’t seem to be space on the board for an image, is there space in your life for what it represents? So often we think we’re supposed to want certain things — a certain income, a gigantic house, a fancy car, whatever it might be. This part of the process should be all about determining what you actually want, deep down. Maybe you’re much happier with a tiny house than a palatial mansion. Maybe you thought you wanted more time with the family, but what you really want is a vacation — all by yourself. Again, try not to censor yourself here. At this point, you may also want to add words. Pull out the terms and words that describe the way you want to be in your business and your life. Be very picky about the words and phrases you choose. You want to project meaning very concisely. Cut out, print out, or even write your words and add them to your board. Once you have your board ready, make space — physically and emotionally. 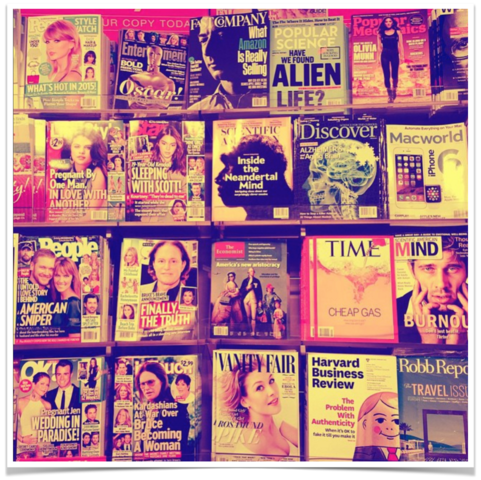 Part of the power of vision boards comes from viewing them regularly, both consciously and subconsciously. Find a place to display your vision that you will see on a daily basis. Mine hang on the wall directly opposite my desk so that I can see them every time I sit down to work. You might choose to hang them in your bedroom, your office, your closet — any place you will see them frequently. Notice as you look at your board what emotions come up for you. Is there anything that’s making you feel some resistance? Are you afraid of any of the images or words you’ve chosen? Is there anything there that still feels like a “should” instead of a true desire? What do those feelings tell you about yourself, your life, your business? Vision boards are just one aspect of your planning for your business and life, but I believe they can be a very important part of it energetically and creatively. I review and update my boards frequently. Our needs and desires change, and so should our vision. If you have a regular planning process for your business, or if you always sit down to write resolutions on your birthday or for the new year, include a review of your vision boards as part of those processes. And stay on the lookout for new images, better words, new inspiration, more tangible representations of what you want. The more specific and emotionally moving your board is for you, the more powerful it will be as a force in your life. 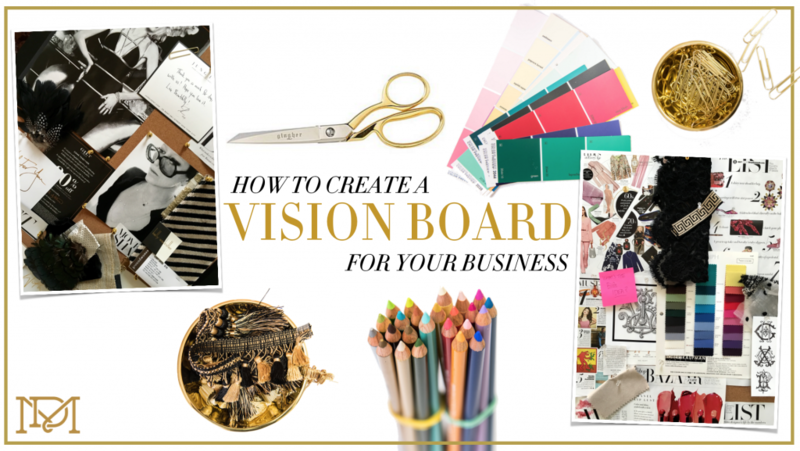 If you are eager to create your own vision board, I’ve created a concise, step-by-step checklist to visioning — just click here to download it and get started right away.